Ultraflex Systems, Inc. has been a leading innovator in the wide format media industry for over a quarter of a century. Known for the innovative, top-quality products that we bring to market each year, we have earned a reputation as one of the best printable media suppliers worldwide. From unique, underwater products like Aquaflex to more traditional back-lit media and everything in between, we have the product lines to meet nearly any application need. Wide format banner materials and other printable media products are available for shipment in our five North American warehouses, and advertisers throughout the world rely on us to quickly process and ship orders to countries across the globe. Our media products are ideal for advertising on billboards, building wraps, exhibition displays, trade show booths, indoor and outdoor banners, and more. Front-Lit Media – Ultraflex Systems, Inc. offers 17 unique front-lit media products from which to choose, and each is available in a wide variety of thicknesses, finishes, strengths, and sizes to help you match your unique application requirements. Back-Lit Media – With 11 unique and innovative products to choose from, our back-lit media line offers a variety of thicknesses and sizes to meet your specific application needs. Each of these back-lit vinyl media products are ideal for banners, billboards, and rear-illuminated displays. Blockout Media – Most of the materials available in our blockout media line are printable on both sides and ideal for use in both indoor and outdoor advertising campaigns. 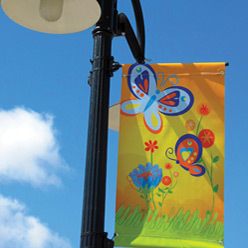 Mesh Banner Media – Ultraflex Systems, Inc. offers 10 flexible, mesh, PVC materials that work with solvent, eco-solvent, Latex, and/or UV printers. Each comes in a variety of styles and widths to better meet your needs, and customers are invited to request product samples. Specialty Media – Ultraflex Systems, Inc. offers a wide range of specialty materials including carpets and materials designed for underwater applications. Aquaflex, our premier underwater branding product, is a coated vinyl with a blue backside that is made of recycled post-industrial pool liner. Compatible with solvent, UV and latex printing, Aquaflex is designed for flat surface aquatic applications including vinyl, concrete, plaster, fiberglass, gunite, steel, and other non-textured surfaces. If you are interested in learning more about the wide format media available for shipment to the USA, England, Scotland, Mexico, Canada and elsewhere worldwide, contact Ultraflex Systems, Inc. today. We are the leading supplier in the printable media industry!